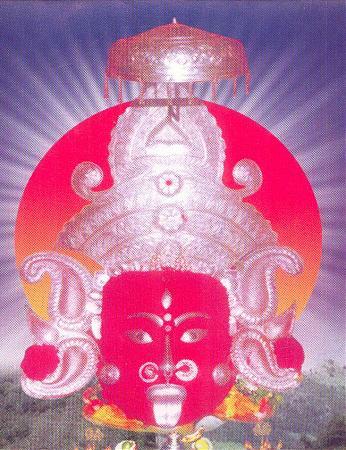 Maa Majhigharini Temple is famous temple of Rayagada District,Odisha, Which is 109 km far Koraput District . This temple is mainly famous in the southern part of Odisha and Andhra Pradesh. Most of the devotees come from Madhyapradesh Chatishgarh & Andhrapradesh Only the face of the Maa MajhiGhariani is worshiped. During Sunday, Wednesday and Friday a large number of Devotees come to this place for worshiping the Goddess. The temple is famous for Chaitra-Parba i.e. March-April of every year. During this festival , the puja committee conducting so many Tribal function near to the temple. It is one of the famous temple of Orissa. It is known since hundreds of years. Every Rayagadian is proud of its glory.The blessings of Godess Maa Majhighariani brings harmony within the people and the region. I pray Maa to shower blessings on all her kids.